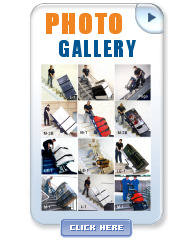 Home of the world's most successful stair climbing hand trucks. Check out our INDUSTRIES pages to learn which PowerMate Solution is right for you! The PowerMate Motorized Stairclimbing HandTruck does 100% of the lifting, virtually eliminating risk of back injury while reducing the effort to move heavy, awkward loads by more than 87%! PowerMate Hand Trucks safely power products up & down stairs, on & off delivery vehicles, loading docks, and in & out of buildings. 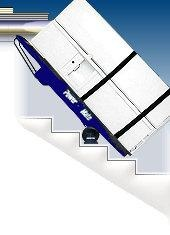 PowerMate stairclimbers are used to safely move items like hot water tanks, boilers, furnaces, gas cylinders, major appliances, office furniture, plumbing & heating supplies, restaurant equipment, vending machines and much more. A PowerMate is four machines in one: a well-balanced dolly; a powered stair climber; a loading dock leveler; a powered tailgate lift! The PowerMate Motorized Stairclimbers will save you money, save back injuries, and save valuable time. PowerMate Safety Moving Systems - the smart, cost effective way to move your products safely. Items which require 2 or 3 man crews to move conventionally can be done by one man using a PowerMate HandTruck. I would like to personally thank everyone at PowerMate for the great service. We purchased our PowerMate probably around 4 years ago, and it has been a blessing. Within a week it was actually nicknamed "the new employee," and is still known as that today. I couldn't begin to count how many times it has helped us. Having a 24 hour emergency service department, we never know when the need to lift, carry, load or move a piece of equipment will come up. Also it is wonderful because we don't have the room for a forklift or any larger type of equipment. I myself have been in situations where I had an emergency call on a weekend, and instead of calling someone in to help load a unit, I use "the new employee." I've actually showed up on job sites with large pieces of equipment, whether it a furnace, A/C, hot water heater, etc, and the customers are amazed at how a "little guy" like myself managed to load it into the truck. Our PowerMate never ceases to amaze everyone. I could go on and on about how much we like it and everything it's capable of. The customer service department at PowerMate is also great. We receive several friendly calls every year reminding us of maintenance and asking how our PowerMate is working out. Instead of hundreds of annoying sales calls that take up time, they are short and sweet and very respectful. Although we have had no problems at all with our PowerMate, I have no doubt that they will help and take care of it quickly and the best they can. I wouldn't hesitate to recommend PowerMate to anyone. It's a wonderful low-maintenance piece of equipment that we use on a day-to-day basis. We love "our new employee." READ MORE customer testimonial letters! Read great articles on maximizing profit, ergonomics, safety moving and more!